Tyree Guyton is an American artist born in Detroit, Michigan, on August 24, 1955, to George Guyton and Betty Solomon Guyton. He grew up on Heidelberg Street and Ellery on Detroit’s East Side near legendary Paradise Valley. He is primarily a painter and sculptor, but is also described as an urban environmental artist. Support for practicing art he got from his grandfather when he was a child, for whom he says was his greatest influence. “When I was eight years old, he (his grandfather) stuck a paintbrush in my hand. I felt as if I was holding a magic wand” Guyton says. About his growing up and artistic style he developed he said: “We were poor, my mother had 10 kids and raised them by herself. Clothes, furniture, everything came from a secondhand store or was given to us. On the floor we had squares of linoleum. On the sofa were stripes. On a chair there were polka dots. Nothing matched, but my mother made it work. Today I paint with stripes and polka dots, and it works too.” Guyton attended Ralph J. Bunche Elementary School, Miller Junior High School and Northern High School, but the accidental fatal shooting of his cousin caused him to drop out of Martin Luther King, Jr. High School in 1972, and join the United States Army. After he was released from the Army he started working as a firefighter and later as an inspector at Ford Motor Company. In 1980, Guyton began art classes at Detroit’s College for Creative Studies and at Marygrove College, where as a painter and sculptor he was mentored by Charles McGhee. McGhee introduced Guyton to the works of Romare Bearden, Jacob Lawrence, and Robert Blackwell. In 1986, Guyton, yet unrecognized artist, began the Heidelberg Project with the help of his grandfather. Named after the neighborhood street, on which it is located, this project became a major work in progress and the driving force behind a nonprofit community arts project. In the neighborhood with abandoned drug-infested houses, he gathered discarded objects from the streets and used them to decorate the outsides of the houses, transforming them into urban art, or to make roadside sculptures. “My art is a medicine for the community. You can’t heal the land until you heal the minds of the people,” says Guyton. As news of his work spread beyond Detroit, visitors from New York City and Canada and from as far away as Zimbabwe, Kenya, and Japan, started coming to see the project. About Guyton’s work an Art News writer stated “Guyton’s compositions consist of the houses, the vacant lots, the streets, the trees, the telephone poles. The power of his imagery is what touches people. So much so they have composed music about it, held concerts around the works, and given money for new projects.” For one of his works Gyuton said: “That was a crack house…. After the first three police raids, it opened right up again. After the fourth raid we couldn’t stand it anymore. So we went on over and painted the place. Pink, blue, yellow, white and purple dots and stripes and squares all over it. Up there on the roof we stuck a baby doll and that bright blue inner tube, and on the porch we put a doghouse with a watchdog inside… Now all day long people drive by and stop to stare at the place… Believe me, in front of an audience like that, nobody’s going to sell crack out of that house anymore.” Some of these houses in his neighborhood were intentionally demolished in 1991, by the artist’s opinion, because the image they were sending was too powerful. The Babydoll House is one of them, which through its use of broken, naked dolls, dealt directly with issues of child abuse, abortion, and prostitution, Guyton stated. Since 1988, he has been a teacher or artist in residence at Marygrove College, City of Detroit, Syracuse University School of Fine Art, Cranbrook Museum, Detroit Institute for the Arts (DIA), Harvard University, University of Michigan, St. Olaf College, Ohio State University, New School for Social Research, Intuit Art Center, Central Michigan University and Brazil’s Universidade Federal Da Bahia. In 2007, Guyton accepted a position teaching an honors program at the Wayne State University. Tyree Guyton’s work has been installed and displayed across the world, including a feature in 1999 by the United States Department of State in the Art in Embassies Program with an exhibition in the American Embassy in Quito, Ecuador. Permanent installations of his work have been established in Sydney, Australia, at the Detroit Institute of Arts, and in Mount Vernon, New York. 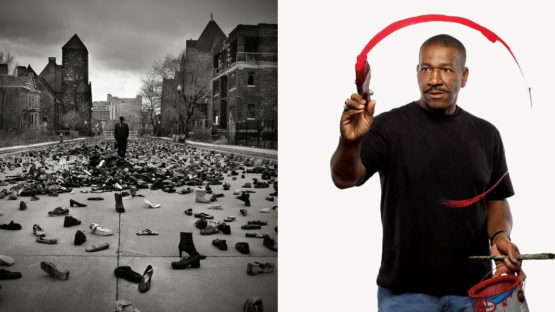 For his work as an artist and humanitarian, Tyree Guyton received the following awards: Wayne County International Artist Award in 2003, Award of Recognition, in 2002, Best Known Artist in Metro Detroit, in 2001, Michigan Artist of the Year, in 1992, Humanity in the Arts Award, in 1992, Michiganian of the Year Award, in 1991, David A. Harmond Memorial Scholarship in 1990, Testimonial Resolution Award, in 1990, Spirit of Detroit Award, in 1989. Tyree Guyton is married to Jenenne Whitfield and continues to live in Detroit.